To celebrate the occasion, the annual Michigan By The Bottle SUPER HUGE Michigan Wine Month Giveaway is back, with dozens of Michigan wineries generously donating swag, VIP tours, festival tickets and more to reward you Michigan wine lovers for your support! Each day throughout May (and into June! ), we'll post a link on our Facebook page to an opinion-based question on MichiganByTheBottle.com. 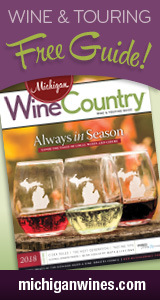 To qualify to enter, you MUST be a Facebook fan of (1) Michigan By The Bottle and (2) the day's sponsor winery. Each daily contest period closes at 11:59 p.m. EDT on that day. Any entries that come in after the contest period closes will be deemed invalid and will not be included in the drawing. Winners for each day will be drawn randomly using the random number generator at Random.org and posted on MichiganByTheBottle.com the following day. Winners have 48 hours to email us to claim their prize before we will redraw. That means you need to be checking daily to see if you're the lucky winner for the day … we always feel bad re-drawing, but we'll do it if we have to! Don't make us do it! Prizes will either be shipped to you by the wineries themselves, or will be available at the wineries' tasting rooms for pickup. (Delivery method will be noted in the giveaway details each day). Please let us know if you do not receive your prize or correspondence from the sponsoring winery within three weeks of winning. If we don't know you didn't get it, we can't make it right! As mentioned above, entrants must be Facebook fans of Michigan By The Bottle and that day's sponsor winery in order to qualify for entry. Entrants must be at least 21 years of age and live in the continental United States. Facebook insists that we cannot require you to share anything as a condition of entry into the contest. But if you feel so compelled to spread the word by sharing the posts on your Facebook page, we’d be eternally grateful! These wineries have come out in full force to participate, so we need to show them some love! We’ve received some great feedback from previous winners about the wonderful experiences/prizes they’ve won. Some of them are still talking about their VIP tours years later, etc. If you enjoy your prize, we would love to see a pic or a few comments posted about it on our Facebook page! Please give a round of applause to this year's sponsors!